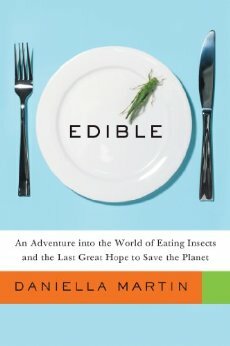 My book, “Edible: An Adventure in the World of Eating Insects and the Last Great Hope to Save the Planet,” is available for pre-order on Amazon! It’s an easy-to-read primer on entomophagy: the history, science, and culture behind this fascinating tradition. It’s also a travelogue of my journey around the US and to Europe and Asia to meet some of the biggest proponents – and consumers – of edible insects on the planet. There are also delicious recipes, a how-to guide for raising insects, and an updated list of edible bugs. If you’re interested in entomophagy, I believe I’ve done a pretty good job of explaining the subject in a way that’s both entertaining and informative. I also ate, and described my experience of eating, some pretty wild species, so there’s that, too. The book officially comes out in February 2014. I can’t wait! i’ve been looking for something like this! I live in London and am keen to find out more about where I might be able to source insects to try out some recipes at home… Any ideas?